Wednesday, March 10, 2010 - Wow, it’s been almost a year since that dive at Morrison springs (see my first blog) Hard to believe I’ve come so far since that dive. I’ve been to so many different places, dove and seen so much in less than two years since becoming a certified diver. I now have over 150 dives. Just a few of the places I’ve dove include Palancar Gardens in Cozumel, the Lost Anchor in Belize, Round Rock in Grand Cayman, swam with dolphins in Roatan, the Oriskany in Pensacola, The Miss Louise in Destin, the Red Sea Tug in Panama City, the Spiegel Grove in the Keys, Devils Den, Ginnie Springs, and hunted sharks teeth Venice Florida. I made my 100th dive at Vortex where diving began for me. I’ve got to see a Hawksbill turtle up close and personal (another story), nurse sharks, a Big A eel, three goliath groupers which I hid from because of their size, saw my first sea horse in Coz, and the first of many dreaded Lion Fish in Belize, and made a friend out of a dolphin in Roatan. I think Nudibracs are cool! I have seen so many Toad fish there are no way to count them and I finally stopped taking pictures of them. I’ve learned that Remoras are pests underwater but they’ll eat left over diver’s lunch if given the opportunity. I go to some dive sites in Destin so many times that I know the fish and knew which ones were supposed to be where. Was disappointed when those familiar fish are not seen. Saw my first bat fish in Destin, first Squirrel fish and Jaw fish in Grand Cayman. I’ve learned that many fish have personalities. I’m continuing to learn and improve my photography skills underwater (just glad film is a thing of the past). I’ve finally learned that I don’t have to take a photo of EVERYTHING (but still do lol). I’ve learned that Ikelight is a wonderful company and that they’ll replace a flooded flash even due to operator stupidity. I also learned that a small bug no bigger than the point of a pencil, when flattened on the O-ring of a camera housing can cause flooding at 40 feet. I’ve also learned the importance of cleaning equipment properly! When not done so it effects your upcoming dives. I like Bodyglove wetsuits and after purchasing 4 different masks I’ve finally found the one that works for me. I’ve had the mouth piece of my regulator already replaced due to biting thru it. I learned that my dive computer will fuss very loudly and lock me out for 48 hours if I miss a deco stop due to trying to take the perfect shot of my first Frog Fish. And I have found some amazing things other divers loose in the water. I also will never have to buy lead again. I met some great new friends, dive masters, and outfits I will be going with on future trips, My dive book is full of names and emails of some really great divers I’ve met and hope to dive with again. I know that divers are great people and really wish I had started diving so many years ago. I have learned that I have no desire to be a cave diver and I’m still not comfortable with night diving. The night diving I will work on. I still have the greatest dive buddy because without him I would not have accomplished and seen so much. Unfortunately, due to mother nature, (and maybe even Karma), I have not been able to get back to Morrison Springs to "conquer" it. That is my goal to complete this year if conditions will allow. I think I might be able to stay off the bottom now. .........I’ll let you know. Funny how small the world is. I logged in and instantly recognized the photo. 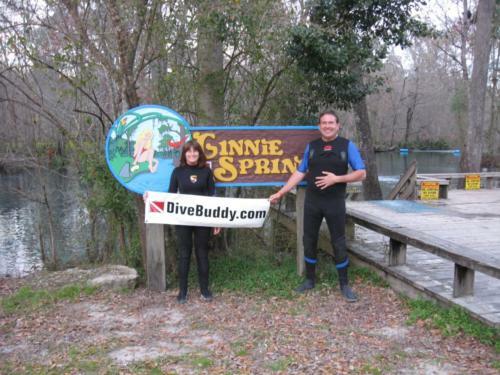 I think it sis almost a recreational diver requirement to visit the springs at some point in your diving life. Thanks for the photo. Awesome article, great photo! Thanks for sharing with us. Very nice article.. Its is hard to believe you were a new diver last year.. You dove so good and natural.. Just like a fish taking to water.. Hope to see ya again in Sept. Mike B.